Is Quantrill a fit for the Nationals or Padres? If I told you the last time a pitcher threw an entire season was during his freshman season, two years ago, and he’s still expected to go in the first round this June you might tilt your head slightly at the computer screen as you reread the sentence. But yet that’s exactly what holds true for Canadian born Cal Quantrill, who after three starts last spring as a sophomore, underwent Tommy John surgery and is just now making his way back, potentially in time for some pre-draft type stuff. This isn’t totally out of left field either considering that at one point Quantrill was deemed a first overall type talent with what he’s been able to show when suited up with the Cardinals. The bloodlines have been well documented throughout the entire process as his father Paul has a 14-year resume in the big leagues which spanned a remarkable 841 games. Early in high school career the younger Quantrill was noted for his pitchability and advanced control, two areas that you’d naturally expect to be refined for a son of a 14-year veteran. But as Cal’s senior year rolled around the velocity began to bump up rather significantly, especially when comparted to the 86-90 mph fastball he showed at the East Coast Professional showcase the prior summer. 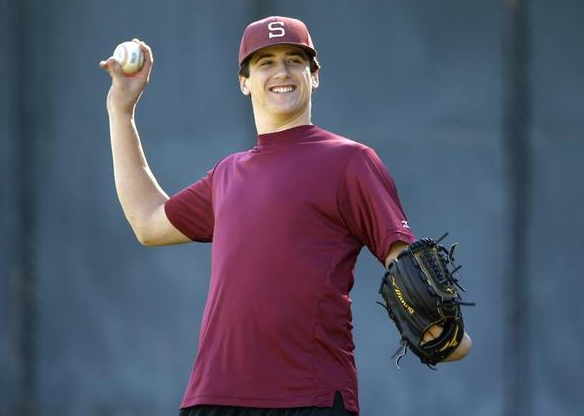 The spring of his senior year served as a precursor of things to come while at Stanford as Quantrill would regularly work in the 92-94 mph range with his fastball, showing the same feel and command that had him shooting up the draft boards in the spring of 2013. As a freshman Quantrill was immediately inserted into the Stanford rotation and very much lived up to the hype as he logged 110 2/3 innings, going 7-5 with a 2.68 ERA, all the while showing refined command along with the ability to miss bats. The arm action remained low effort and the delivery was pure, but unlike his high school days Quantrill began showing a changeup that you could throw a plus grade on and have no qualms about doing so as the upper-70s offering featured plenty of diving life and deception. In an ever changing baseball world where pitchers are no longer buried for undergoing Tommy John as we’ve seen with the likes of Lucas Giolito, Erick Fedde, and Jeff Hoffman, Quantrill very much appears to be next in line and while some think the Nationals could be a good fit (they drafted both Giolito and Fedde), keep your eye on a team with several first round picks such as the San Diego Padres who Brian Sakowski recently mocked him to.